Financing Available! Check out our Bundles and Packages! Low Price Guarantee! Call 1 (800) 487-7397 for details. Retail store only. Call 1-800-487-7397 for details. 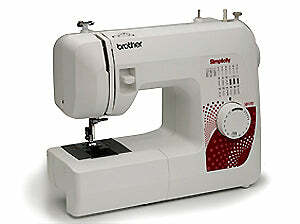 SB170 has 17 stitches, 1 buttonhole, free arm, bobbin winder, top drop-in bobbin, LED lighting, upper thread tension control. Where Customers, Quality And Service Are #1. Give Us A Call For Personal, Knowledgeable Help! From the Simplicity® Limited Edition line by Brother™ this easy-to-use sewing machine has the features to help you easily tackle your first sewing project. The SB170 is simply compact, lightweight and fun to show off to your friends at sewing club! 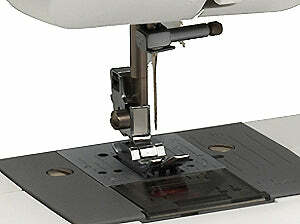 Start creating beautiful garments with 17 built-in sewing stitches, including 1 style of 4-step auto-size buttonhole. Creativity and variety are virtually limitless with the built-in free arm for sewing on hard to reach areas like cuffs and sleeves. This fun sewing machine is for you! 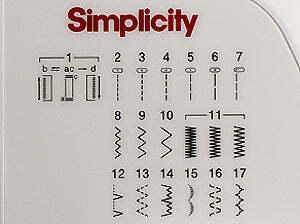 17 Built-in Stitches including 1 style of 4-step auto-size Buttonhole. Brightly Lit LED Work Area. Free Arm for Sewing Cuffs and Sleeves. Jam Resistant Drop-in Top Bobbin. Independent Bobbin Winding Motor: No. 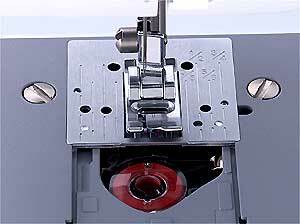 Automated Upper and Lower Thread Cutting: No. Computer Connectivity with Update Capability: No. Work Space (Height & Width) inches: 3.8 x 6.2. Maximum Sewing Speed (Stitches Per Minute): 800. Back to Beginning Key: No. Built-in Sewing Stitches (Includes Buttonhole Styles): 17. Built-in Sewing Lettering Fonts: No. My Custom Stitch™ Feature: No. Needle Position Key (Up/Down): No. Automatic Height Adjuster™ AHA® Feature: No. Included Accessory Feet: Buttonhole foot, Button Sewing foot, Zipper foot, Zigzag foot. Other Included Accessories: Needle set, bobbin, darning plate, oval screwdriver, power cord, operation manual and instructional DVD. Warranty: 1/3/25 year plus warranty.